By ReMake, March 21, 2016 in Plugins - Publishing ONLY! This plugin can be useful for selecting objects in the image or for creation a color mask of object. The plugin is based on the script of Color Target plugin by rwp80. This effect allows you to create a color mask of object in the image. You can then select the object using Magic Wand ( ) for further work with him. See short tutorial and examples of effect's work in the Color Range Test topic. Examples of effect's technique you can found in How To Use Color Range effect topic. Примеры работы эффекта и приемы работы с ним вы можете посмотреть в уроке Как использовать эффект 'Цветовой диапазон'. I don't know if it's a bug or I'm using it wrong but it even though I used the color picker, the color doesn't appear in the plug-in, it defaults to white. I looked at the source code, and I am wondering: why are you using the double type for the color channels? Surely the int type would be sufficient, as there aren't any operations in the script that would produce numbers with decimal places. Hmm, I'm experiencing the same situation described above by AgentGoodSpeed. ... but it even though I used the color picker, the color doesn't appear in the plug-in, it defaults to white. Fixed. Primary color now color by default. I'll work on it today. Thanks for the tip. Congratulations, ReMake ! I like this plugin. It helps me in extracting images and so many purposes. An unfortunate spelling error. My apologies to anyone who downloaded the English version of the effect. Re-download the fixed version, please. Thank to all for your comments, remarks and tips. ReMake, this plugin is WONDERFUL! It's easy to use and with very little tweaking, it achieves a near flawless recoloring. It just looks so smooth.....no splotches! 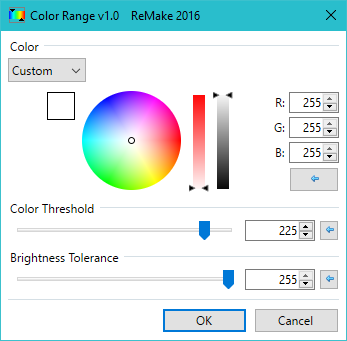 Fixed color selection error in the English version. Update this plugin from first post, please.